I don't know about you, but for me one of the most time-consuming portions of GM preparation is putting together a decent map for the game. Don't get me wrong.....I love doing mapwork, but the time investment isn't always worthwhile, or even available. What I've done on a personal level is start collecting potentially useful maps for a future time I might need them. 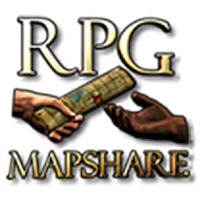 RPGMapShare has taken this approach on a much larger, and freely available scale. At last count there were over 1400 maps to peruse and download. 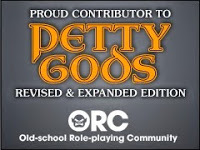 At first glance it looks like all the files are old, but there is new content being added all of the time. The way the site is organized you can download entire libraries of maps, just particular sub-categories of maps, or individual maps. You add the maps you want to an online shopping cart and when you've made your selections you proceed to "purchase" them and start your download. The files are free, the website designer has just put an online shopping cart module to good use. There is also a "what's new" category and search function that makes it easier to find something that you need. Also pretty cool is the ease of uploading maps that you have made and would like to share with the community. If you shave some time off of your game prep by borrowing a map or file, you can reinvest that saved effort by uploading one of your own maps for someone else to use. A great idea that would have the Frugal GM's seal of approval...providing there was such a thing. A Two thumbs up will have to do.